There is a tradition of pilgrimage to Slieve Snaght and a well near the summit is associated with a cure for blindness (Tobar na Súl) [Colhoun]. See Máire MacNeill, 'The Festival of Lughnasa' (pp. 145-46) for details of the festive assembly on Slieve Snaght. The mountain is said to be so named because snow lies on it until the fair of Carndonagh, which is the 21st of May [OSNB]. Its satellites are Slieve Main, Crocknamaddy and Damph. A limelight erected on the summit of Slieve Snaght was observed on Divis by the Ordnance Survey in 1825. This enabled them to establish trigonometrical baselines and link the Irish survey to the English one, before going on to survey the whole country of Ireland. 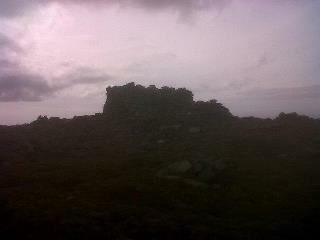 Slieve Snaght is the highest mountain in the Inishowen area and the 261st highest in Ireland.